Do you own investment property? Manage your own properties or flip houses? If you do, then you know how important it is to educate yourself and build strategic partnerships. 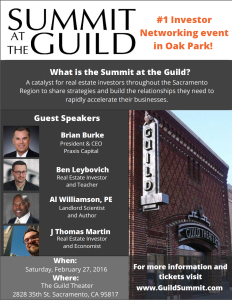 Join us at the #1 Investor Networking Event in Oak Park this Saturday, February 27, 2016. Other like-minded commercial/residential landlords, house flippers, and wholesalers looking to form strategic partnerships. Strategies to run your investment business for long-term success. Negotiation tactics to help you create more lucrative deals. A success map to help you advance to more profitable positions in less time. Imagine how your business will improve once you become an insider!